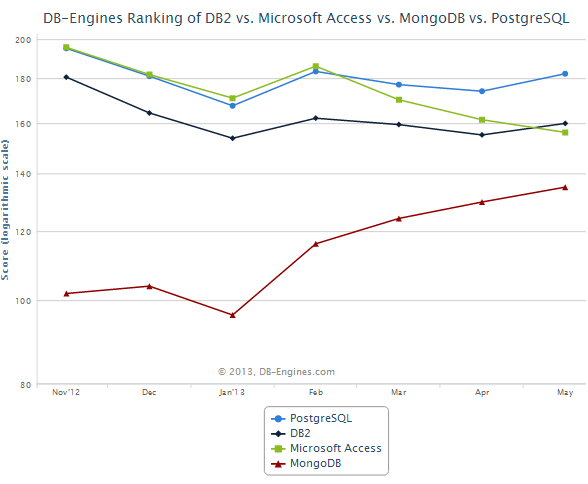 In the new edition of the DB-Engines Ranking MS Access loses a rank to DB2 and falls back to rank #6. When we made the first edition of our ranking, we were surprised to see MS Access at rank #4, right amongst the grown-ups. Since then, it has lost one rank to PostgreSQL and now another one to DB2. If the current trend continues, MongoDB will be next. MySQL at rank #2 increased the gap to SQL Server to a comfortable 100 points. Teradata makes its first appearance in the top 10, surpassing Solr by a tiny margin. The highest ranking newcomber in the list is Hive at rank #17, a data warehouse system based on Hadoop. New systems also include a set of tools that are often called data grids or distributed caches, most of them based on Java. We included the important ones, provided they offer persistency or some type of client-server model, so that they can acually be used as a database system. The new systems include Ehcache, Coherence, Hazelcast, ZODB and GridGain. Some people contacted us to ask for more systems to be included in the ranking. We are always grateful for any feedback, and open to suggestions.